Thousands of citizens in Dundrum, Ballinteer, Sandyford and Leopardstown are now paying some of the highest rents in the country to these multinational companies which are exempt from paying Corporation Tax on their massive rental incomes. For the last three years Éirígí local election candidate for the Dundrum area, Brian Leeson, has been monitoring the growing negative influence of the REITs on the housing sector in Rathdown. On Tuesday he will deliver a presentation based on his extensive research. The content of that presentation will shock and anger ordinary people who have been forced to foot the bill for the bank bailout, NAMA, austerity and the current housing crisis. Brian will also outline the short-term steps that need to be taken to secure meaningful rent control and security of tenure for those in private rental and the longer term steps that need to be taken to end the housing crisis once and for all. The meeting is free of charge and open to all. Anyone who is renting in the private rental sector, or who is interested in understanding the causes of the housing crisis, could do a lot worse then attend. It starts at 8pm on Tues, Oct 23rd in Taney Parish Centre in Dundrum. Posted on October 22, 2018, in 21st century republicanism and socialism, éirígí, Economy and workers' resistance, Housing, Irish politics today, Public events - Ireland, Social conditions, twenty-six counties, Workers rights. Bookmark the permalink. 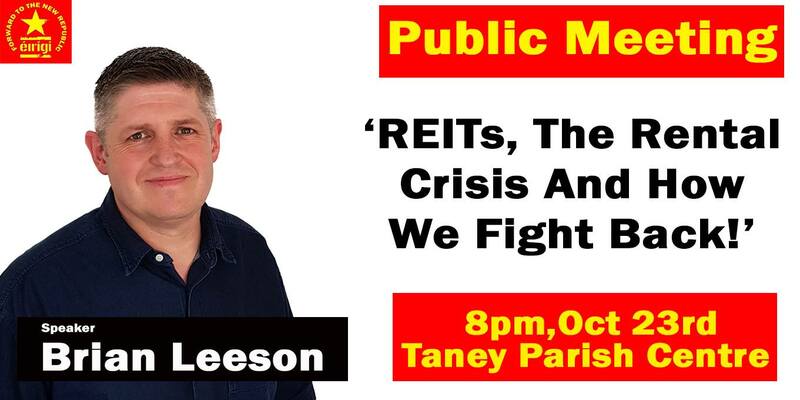 Comments Off on REITS, the rental crisis and how we fight back: Public meeting in Dundrum, Tuesday, October 23.